Qualifying action resumes on Wednesday 8th November with day two of the three-day qualification tournament which precedes the Seamaster 2017 ITTF World Tour Platinum German Open to be held from Friday 10th to Sunday 12th November in Magdeburg. Group stage conclusion tops the day's agenda in both of the senior singles events as the unseeded players aim to claim their places in the next round. Day one of the qualification competition saw Song Maeum and Elizabeta Samara begin their Women’s Singles group stage campaigns with a victory apiece as the Korean and Romanian representatives enjoyed positive outings against Austria’s Amelie Solja. With a spot in the preliminary qualification round on offer Song Maeum and Elizabeta Samara will meet face-to-face on the second day of play in what could prove to be an exciting battle for first position in Group 7. Lin Ye showed great determination in her opening Group 13 fixture against Lin Chia-Hsuan, recovering from three games to two down to beat the Chinese Taipei player in a seven games thriller. 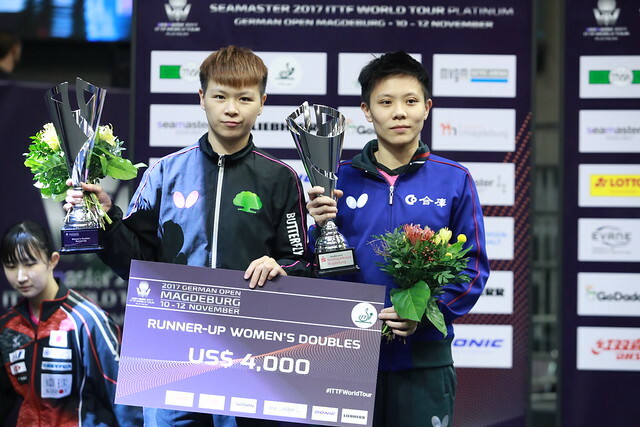 But, the Singapore competitor will have to be at her very best if she is to achieve her second group victory in Magdeburg as she prepares to take on the favourite for top spot Liu Jia of Austria. The host nation’s Sabine Winter is just one win away from topping Group 26 and will seal her qualification through to the next stage of the event if she prevails over Minami Ando of Japan. Over in the qualifying group stage of the Men’s Singles tournament the top ranked players in the groups enter the action, including Tiago Apolonia. Competing in Group 15 Tiago Apolonia begins the day with a difficult match against France’s Joe Seyfried prior to his meeting with Russia’s Vasily Lakeev, but will the Portuguese star live up to expectations and finish at the summit of the group or is there a potential upset on the cards? Robert Gardos could be set for a tricky outing in Group 29 as the 38-year-old officially opens his account in the qualification tournament. Awaiting the Austrian are tough fixtures against Thailand’s Supanut Wisutmaythangkoon and Brazilian competitor Gustavo Tsuboi, while in Group 3 Sweden’s Kristian Karlsson aims to finish above young stars Adam Szudi and Cristian Pletea of Hungary and Romania respectively.